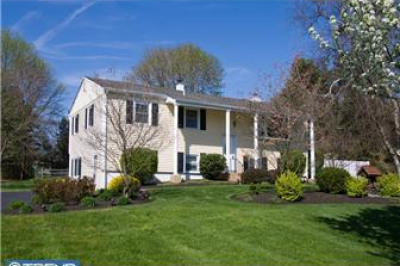 This fully updated ranch is tucked into a quiet section of New Hope Hills in Solebury Township. The recent renovation was designed by famed local designer, and family friend, Jim Hamilton of Lambertville, NJ. It includes a large living area with cathedral ceilings that is gushing with natural light and houses a brand new cooks kitchen with a butcher block eat in counter. A dining room that seats ten and a cozy family room with a large wood burning fireplace is the perfect space to live, and entertain. Both bathrooms have been completely renovated with all modern fixtures, tile and conveniences. The total renovation also includes a new HVAC system, electric service, new plumbing, septic, roof and cedar deck off the kitchen. The walk out basement houses a recreation room and office and leads out to a stone patio and newly landscaped gardens. A detached, two-plus car garage building also has ample tractor storage inside and an attic above. Listing agent is related to seller.